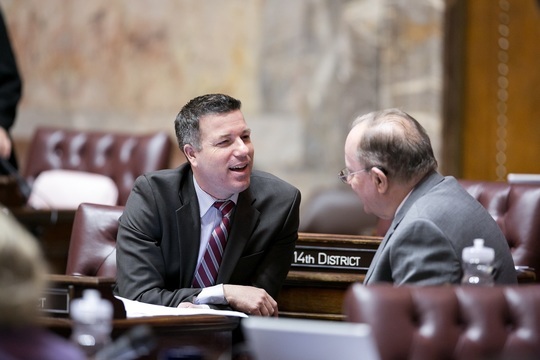 During a break in voting this week I was able to discuss legislation with Senator Mike Padden of Spokane Valley, chairman of the Senate Law and Justice Committee. Yesterday the Senate reached its most important milestone of the session so far, which was the deadline to take action on bills introduced by senators. That makes today the day when the Senate committees begin focusing on considering legislation passed by the House, and the House committees do the same with the legislation we had approved through yesterday. Thankfully, all five of my prime-sponsored bills received Senate approval. Two were referred to the House Agriculture and Natural Resources, and one will have a public hearing this afternoon. Two were referred to the House Transportation Committee, and again, one is already set for a committee hearing later today. The fifth was referred to the House Labor and Workplace Standards Committee. Senate policy committees have through March 29 to consider bills passed by the House. Our fiscal committees (including the Transportation committee on which I serve) have an additional week to complete their work on House legislation..
A recent Supreme Court decision about compensating workers for rest breaks has entangled tree fruit growers and other agricultural producers in our state. In a bipartisan 28-18 vote, the Senate approved legislation I introduced at the request of the Washington State Tree Fruit Association that would respond to the court ruling in a way that is good for both employers and workers. Senate Bill 5720 addresses the 2015 decision in Demetrio v. Sakuma Brothers Farms, Inc. It involves workers paid not by the hour but by the piece or pound. The high court decided employers must pay employees for rest breaks separate and apart from piece-rate wage payments. This has led to many recent lawsuits about prior uncompensated breaks. The lawsuits jeopardize orchards and people’s livelihoods, looming like a dark cloud over a leading industry in our region and the state as a whole. It’s clear to me, in working with stakeholders to develop this bill, that growers were compensating their employees in good faith, following state guidance and industry practices. I don’t want them punished by extended lawsuits, and I want the workers to get paid. SB 5720 details a process for how growers can compensate employees for past uncompensated rest breaks. If they choose the options we approved, workers will be paid and the growers will be protected from lawsuits. The mix of legislation we considered this week during many hours in the Senate chamber included some high-visibility issues. Here are a few examples. Distracted driving: The Senate passed an update to the 2009 texting-while-driving law that would acknowledge the evolution of mobile phones and similar electronic devices. If Senate Bill 5289 becomes law, drivers would basically be prohibited from holding a phone or similar electronic device while driving. I voted against the bill because I believe it goes too far in restricting the use of phones beyond texting or talking. Public safety: We spent a lot of time in 2016 looking into the scandal involving the state Department of Corrections and its early release of prisoners, which led to the deaths of at least two innocent people. Not surprisingly, the investigation led to legislation, which won unanimous approval this week. Senate Bill 5294 would require an audit of the departments at DOC involved in keeping track of inmates’ release dates and several other actions intended to prevent a similar public-safety fiasco from happening again. I voted for the bill because I believe these reforms are necessary. Protection from an income tax: SJR 8204 would amend the state constitution to prohibit the imposition of a state or local income tax on individual income. This includes income from wages, investments, sale of goods or services, or any other source. Proposed constitutional amendments require a higher threshold of approval than a regular bill. They must receive a two-thirds approval in both the House and the Senate and then be approved by a simple majority of statewide voters. I voted for the proposal to send this question to voters, but it fell short of the two-thirds threshold needed for approval. 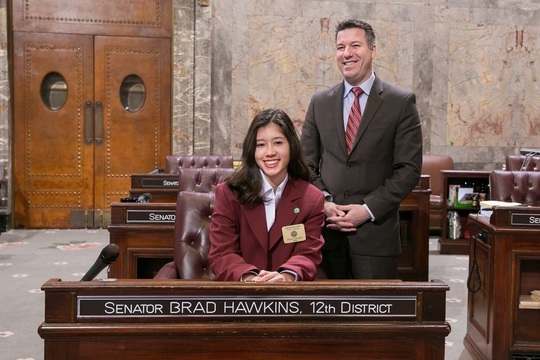 I was pleased to sponsor Wenatchee High School junior Estela Navarro as a Senate page this week. The pages are especially important when we spend all day voting in the Senate chamber because they help distribute legislative documents. Estela did a great job!